This book sets out to explain how scientific research is conducted. Editors Mauro Maldonato and Ricardo Pietrobon and contributors focus on the emerging inter/transdisciplinary dimensions of research. They use an approach grounded in the sciences of complexity to counteract the disciplinary fragmentation and decontextualisation created by a reductionist approach. The underlying theme throughout all the chapters is a practical focus on improving the way practitioners conduct and educate for scientific research. By rejecting the reductionistic approach to science, the authors propose research platforms that offer a broader perspective on the nature and practice of research, and the implications thereof for more complex and productive research environments. 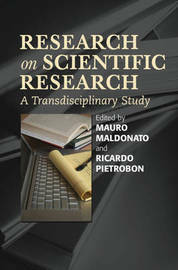 This volume combines leading-edge essays that focus on the inter/transdisciplinary study of research systems, from a group of international researchers from Italy, the UK and the United States. While the book is essential reading for all those involved in planning scientific research projects, the arguments put forward for the conduct of research have broader implications and applications for the social sciences and education.